On the 17th August, 1831 the steamer Rothsay Castle left Liverpool at 11am on her regular journey to the Menai Straights. However, the rough weather made the sailing difficult and she made very little headway. The passengers became worried and asked the Captain to turn back, but he refused. By midnight he had still no made land, and an hour later the Rothsay Castle struck Dutchman Bank, then out of control struck a sand bank off Penmon. Of the 150 passengers on board, 130 lost their lives. 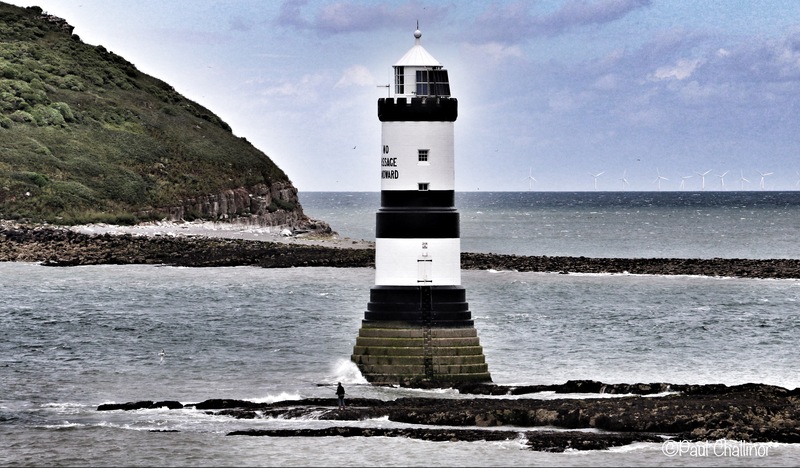 This hastened the decision by Trinity House to build a lighthouse to guide ships on the Eastern tip of Angelsey. Work commenced in 1837 to build the black and white stone tower on a reef between Trwyn Du and Puffin Island. The light was lit in 1838. Originally manned by two keepers, it was automated in 1922 and the keepers were withdrawn. In 1996 the light was converted to solar power. As we were walking around the shore we heard a bell being tolled on a regular basis. But I couldn’t see why or decide exactly where the ringing was coming from. The explanation comes from a further modification carried out in 1996 when a unique mechanism was installed to sound a 178 Kg bell every sixty seconds to act as a fog signal. As well as the reef marked by the lighthouse, the small strait between Trwyn Du and Puffin Island has another rocky outcrop dangerous to shipping. This is marked by a large red beacon. Puffin Island or Ynys Seiriol, refers to Saint Seriol. The son of Owain Ddantgwyn, a 5th-century ruler of the Kingdom of Gwynedd, and the brother of Saint Einion Frenin, a 5th- or 6th-century king in the Llŷn Peninsula, Seiriol founded and governed a clas (ecclesiastical settlement) at Penmon on the Anglesey. In later life, he abandoned his responsibilities there to establish a hermitage on the nearby island, where his remains are thought to rest. King Cadwallon ap Cadfan of Gwynedd is said to have sheltered here in around 630 when fleeing an invasion from the Kingdom of Northumbria. A monastery existed on the island in the late 12th century and was mentioned by Gerald of Wales who visited the area in 1188. He claimed that, whenever there was strife within the community of monks, a plague of mice would devour all their food. The ecclesiastical emails still exist on the island. Puffin Island is now privately owned, and has been designated a Site of Special Scientific Interest and it’s not possible to land unfortunately, so this will have to remain an unattainable island for now.